Delicioso tour pelos museus do Vaticano e Capela Sistina. Nosso guia (Luca) foi perfeito! Conhece muito do local, suas histórias e seus detalhes, o que torna o passeio muito especial. Sem o guia em português seria só mais 1 museu com belas obras, mas sem sentido para quem não é estudioso da área. DICA: É um passeio longo, com várias escadas e rampas - vá alimentado, calçado confortável e com água. La visita è stata gestita con molta professionalità da Lorena. Unico "intoppo" il gran numero di turisti e non tutti proprio educati. The tour is by far the best way to visit these sights. 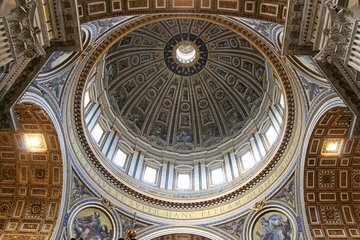 The guide takes you past the long lines and into the museum, Raphael Rooms, Sistine Chapel and St. Peters. Our guide was excellent. Foi tudo bem,as 3 horas e meia passaram rápido,não se tornando chato,pois a guia foi muita paciente e de bom humor. Surely the freezing cold and wind of that day could have been adjusted. We stood outside for about half an hour looking at a picture of the sistine chapel. Surely we could have been moved to a better place. I am a senior and was horribly cold. Looking at a poster in the wind was not very helpful. Also, although the guide knew her material, her method of delivery was pretty glib and annoying . Maybe the wind made it even worse. I was rarely ever so physically uncomfortable. We pre-booked this tour as we expected the Vatican to be busy on a Saturday afternoon. So glad we did. We met our tour guide Janette who introduced herself to us and found out about us (17 in the group), our names and where we came from. Entry to the Sistine Chapel was very smooth and we learned many great facts and anecdotes about Michaelangelo and the various popes. The tour lasted about three hours and was value for money. Primeiramente, paguei para tour em portugues e horas antes trocaram para espanhol, nos colocaram com um grupo de idosas que infelizmente não conseguiam subir e descer escadas. O q salvou foi o guia q era bom. Semplicemente 3h30 piacevolissime senza fare coda.guida bravissima e preparatissima. Nulla da dire.Un po' cara ma ne vale la pena!! !